On the pick side of things, Mick uses Carbon Fiber Max Grip Jazz III 471R3 Picks. 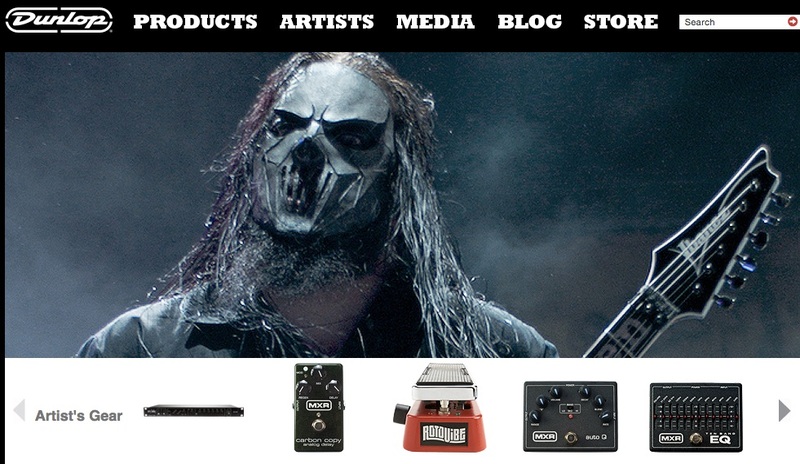 [Source](http://www.jimdunlop.com/artist/mick-thomson). Mike’s current main squeeze is a 1985 Gibson Les Paul Custom that he bought in his hometown of Chicago at Rock N Roll Vintage. Since acquiring the guitar, he dropped in new pickups—a high-wound Lollar Imperial in the bridge and a standard Lollar Imperial in the neck. Sullivan goes with D’Addario NYXL .011–.056 strings and tunes this one to a DADGAD variant—C#-G#-D-G-C-A#. When it comes to picks, he’s been loyal to the Dunlop Max-Grip Jazz III since he found some inside a box for an Andy Timmons pedal. Great for speed picking and little movements. I prefer a thicker pick for general playing though. The only Pick I'd personally ever use and touch, introduced to me by a Dear Friend and since then this particular model in Red is my favourite JAZZ III design. Warm Tone and great Articulation with this Pick. Super hard pick with maximum grip. Great precision for electric guitar solos. These are the picks I have always used, and will use probably forever. If you play fast, buy them. These are very good for fast picking, but I wouldn't use this during gigs because they are so small that my picking hand thumb starts to hurt (dunno why it's so). The max grip surface works as advertisized, doesn't drop in accident. Never wear down. Too small. Good for soloing, but if you're playing rhythm, get something else.